A range of technically engineered high pressure pumps, designed to give least whole life costs and reduced spares requirements. The bloc construction of the Epsilon range has reduced overall dimensions and incorporates Mono's unique Flexishaft® drive transmission, with a 10 year warranty. The option of an inspection cover permits removal of rags when this is an issue and the Epsilon range has shared componentry with the popular Compact C transfer pump, helping customers and stockists to reduce the inventory of replacement parts. 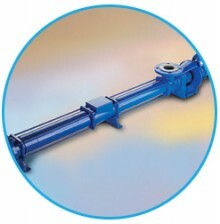 For high pressure pumps, please contact Mono.